Petersburg CITY / Guide to St. Petersburg, Russia / News / City / High-speed train service between Moscow and St. Petersburg postponed. 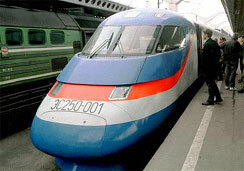 High-speed train service between Moscow and St. Petersburg postponed. According to Ministry spokesman Anatoly Yakovlev, test trials of the Sokol electric train have demonstrated that its basic systems and equipment function properly. He told Interfax that minor defects discovered during the trials will be eliminated during further work on the project. According to the Railway Ministry, at least 18 trains of the Sokol type will be required before 2010 to run between St. Petersburg and Helsinki, Finland, and from Moscow to St. Petersburg, Smolensk, Bryansk, Voronezh, Nizhny Novgorod and Rostov-on-Don. Experts say the infrastructure of Russia's railroads makes it possible for trains to run at a speed of more than 200 kilometers an hour.